Dublin's architecture... in the future! This is just wonderful. 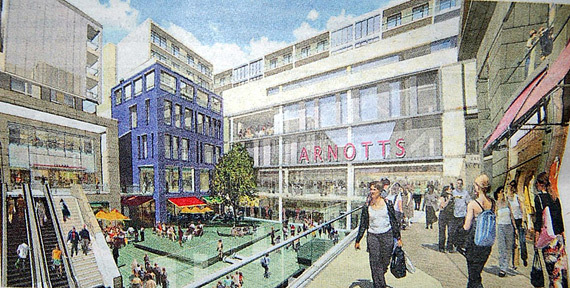 Via the Dublin Blog, an artists rendering of a proposed development of Dublin’s northside city centre that’s due to be completed in 2010. I love them. 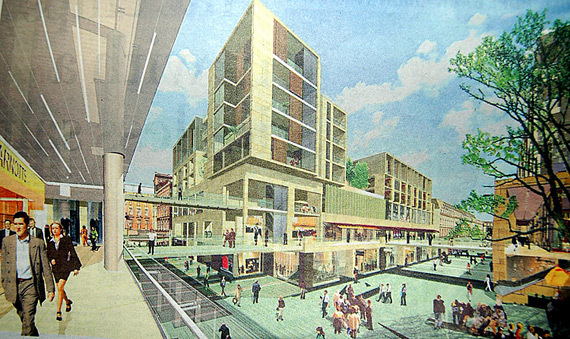 They look as if an optimistic futurist sat down in 1980 and drew what he thought the city might look like in 30 years time; brown suits, watercolour paints, modernist slipwayed architecture, geometric typography (Futura?) and all. I’m not sure if there was some sort of stylistic intent at work here, but they look to me like they could be postcards by John Hinde scanned straight from a back issue of Ireland’s Own. The only thing missing is jetpacks, or better still Segways, which themselves seem to be quickly becoming a naive vision of 21st century urban living that we will soon look back at and laugh.